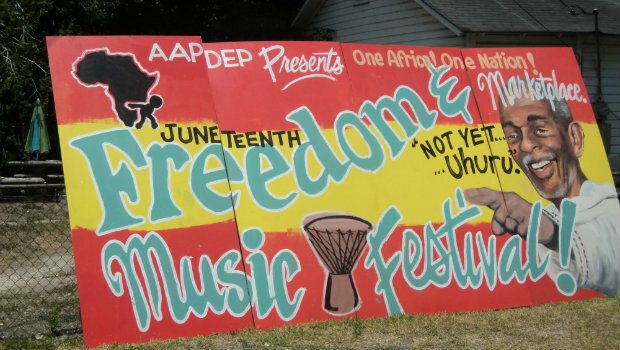 The 6th Annual Juneteenth Festival set for Saturday June 16, 2018 is sponsored by the All African People’s Development and Empowerment Project (AAPDEP) and the International People’s Democratic Uhuru Movement (InPDUM).Set at the Gwen Archie 5th Ward Community Garden at 3707 Brill Street in Houston, the festival promises to be a day of fun and games for the children and for all, a day of fantastic music, including R&B, Hip Hop, Rap, Reggae and Gospel. Poets and spoken word artists will also be there. This will also be a day of serious discussion on the plight of African people throughout the world. Dr. Aisha Fields, the International Director of AAPDEP, and Kalambayi Andenet, International President of InPDUM, will head the list of guest speakers from outside Houston. Local speakers will include Maranda Evans, Founder of The Troubled Movement; Derrick Muhammad of the Nation of Islam and Anamechia Joseph of Grow with Mech. Especially important, this will be a day of economic development for the black community. Many vendors, from arts and crafts to great food, will provide goods and services that are not available to us on a daily basis. It will be a day that we shop among ourselves and our resources stay in our community. One of the major goals of “Juneteenth Not Yet Uhuru” is to build the One Africa! One Nation! Marketplace! This would be a permanent venue where African people can promote our own economic development enterprises. Juneteenth is the oldest celebration commemorating the ending of chattel slavery in the United States. U.S. president Abraham Lincoln signed the Emancipation Proclamation on January 1, 1863. “Juneteenth Not Yet Uhuru” will stress to all who attend that 152 years later, since the signing of the Emancipation Proclamation, Africans in the U.S. are still a colonized and unfree people, just like Africans all over the world. In 2018, our dire economic situation and the deadly relationship the black community has with the police throughout this country attest to our colonization. That’s why we say “Not Yet Uhuru”. Uhuru is a Swahili word that means freedom. We are calling on all who can to make it to Houston and be a part of this effort to free ourselves! For more information contact: 254-979-8133.